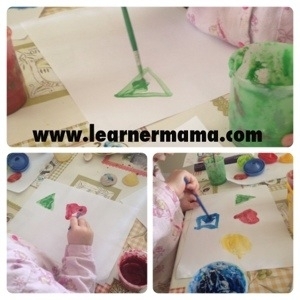 Painting with toddlers can be stressful but if you follow a few simple tips it can be a fun and calm experience. Even better is to make it educational too. 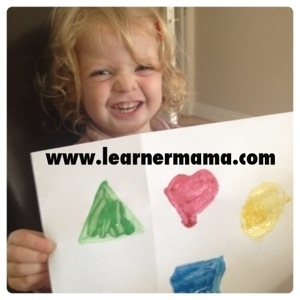 Painting is a great time to introduce colours and shapes to your toddler. If they are having fun it will make the learning easier and more likely to be retained. 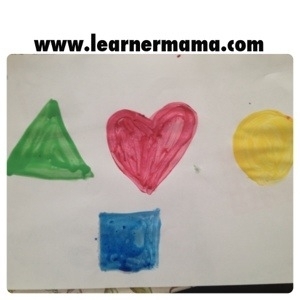 This is a really simple way to introduce and reinforce the learning of shapes and colours while having a bit of messy play. 1. Get paints ready. I chose four basic colours – red, green, yellow and blue. 2. Do a template that your toddler can copy. In my case I painted a RED HEART, GREEN TRIANGLE, YELLOW CIRCLE and BLUE SQUARE but do as many of as few as you like. I think judging by the look on her face she had a blast! While she knows the shapes and colours well it was a fun way to reinforce it for her. Next time I will make it harder with new shapes and new colours! Look at that face! What a cutie! Great job. I always get the paper and anything else we need out first and only put the paint out at the last possible second or I find my girls will have started painting anything and everything within reach! Don’t be fooled by the cute factor! She would buy and sell you 🙂 great tip on the paint! !